You are here: Home » 5am Broken Ladder – Warm Temps and …. The Sun! 5am Broken Ladder – Warm Temps and …. The Sun! Tuesday: Track. Be sure to get a sufficient warm up and warm down. Crooked ladder: 2 x 200 200 rest 2 x 400 200 rest 2 X 800 200 rest 1 x 1600 200 rest 2 x 800 200 rest 2 x 400 200 rest 2 x 200 200 rest. This is a key work out. Everything should be done at your goal half marathon pace. That includes the 200’s which will feel painfully slow. I want you to be able to nail that pace in your sleep. Seemed easy enough. Boston Pete joined me at 5am at CRS Track for the fun. I first gave him my Boston Marathon Passport so he can pick up my bib. If I go up to Boston to run he will have it. If not he gets a second shirt.. I am coming to the realization that not running is the more likely scenario. It was warm this morning so we were actually in shorts to start out. First time for that since last fall I think. We got in our 1 mile warm up and started the work out. New batteries in the headlamp helped at I had a nice bright light in front of me. I took the pace for the first one. We were to hit 44’s and I was just a touch slow as we hit 45. 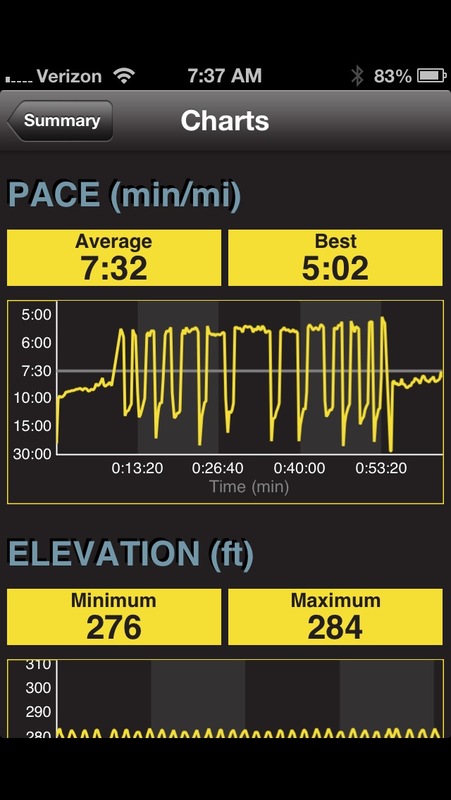 No biggie it was 5am and I expected a few intervals to find pace. Pete took the 2nd 200 and it felt faster. Nope same pace… Hmm… We started the 400’s and those we hit on pace.. After finishing the first set of 400’s I knew the workout was about to begin. This type of workout is the kind that feels so easy to start but slowly catches up with you. I was worried about the mile .. Well we hit the 800’s right on pace and the workout still felt easy. 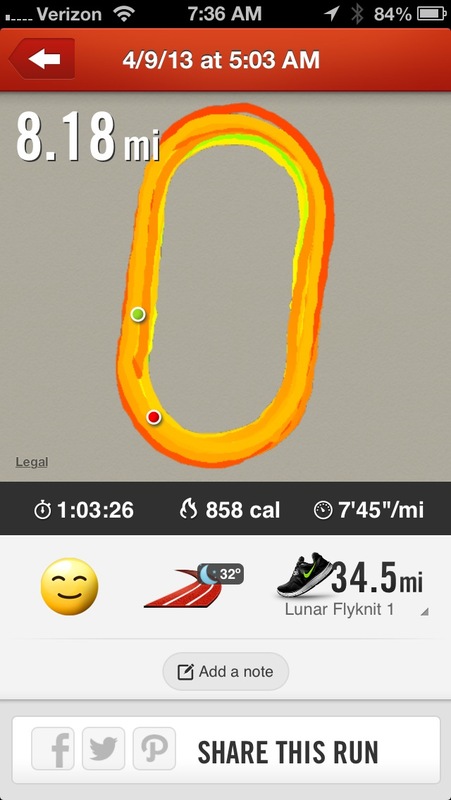 I took the mile and we hit it in 5:52 which was right on. Pete ran the next 800m and then he was done. He finished up his cool down and then I was on my own. I finished up the rest actually a bit faster than HM pace although not much. All in all this felt “quickish” but not killer. I think that is good as I have more fast stuff this week and I should be able to recover from this quickly. 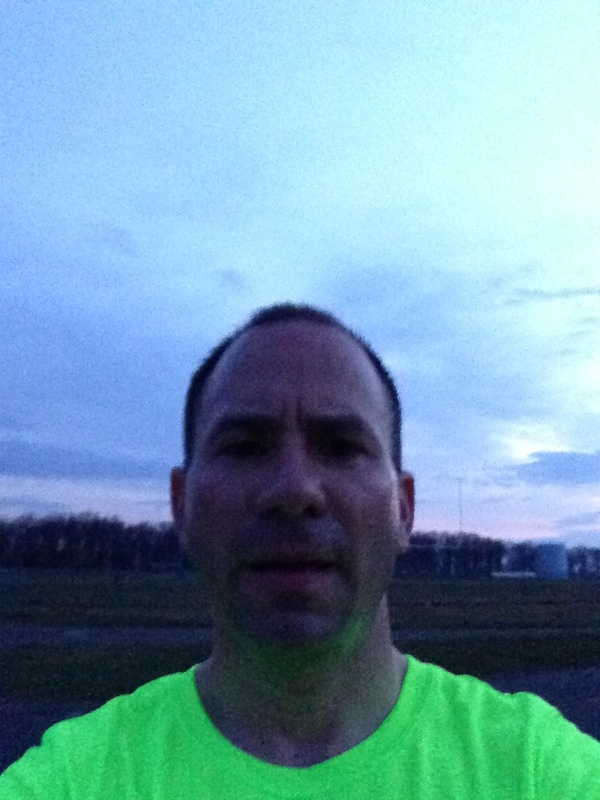 As I started my mile cool down I noticed the sun starting to come up! ← Twice the Run, Twice the Fun?? Nice job! You are rocking it!